Perry and I had similar thoughts this afternoon, while Pax is too busy emailing pictures of himself to himself on his iPhone. I thought this a good time to share with you all that, if you haven’t heard, Wilco is the musical guest on Saturday Night Live (hosted by Ellen Page) this week. Wilco and Juno…someone at SNL knows what’s up. Lover, You Should’ve Come Over, Jeff Buckley. A top-10 all-time song for the Padre. Shiver, Coldplay. Some of their stuff from their first two albums is cool, regardless of what your hipster friends tell you. Heart of the City, Jay-Z. Whenever I’m on the highway, I wish I had multiple passengers so I could drive in the HOV lane. We Major, Kanye West w/ Nas. Too long, but the “feeling better than some head on a Sunday afternoon” line is worth it. A Punchup at the Wedding, Radiohead. Forgot that I actually liked this song…disappointing album though. Roll with It, Oasis. Sorry ladies, Liam’s taken. Make Me Better, Fabolous. As mentioned in my best of 2007. Conquest, The White Stripes. Cooooo-oooooooooo-oooooooooooooonnnnnnnnnnnn-queeeeeeeeeeeeeeeeeeeeeeeeeeeeeeeeeeeest. Neighborhood #3 (Power Out), Arcade Fire. Unquestionably my favorite AF song. I Could Die For You, Red Hot Chili Peppers. From By the Way, probably one of my top-5 all-time most-listened-to albums, only because freshman year it was the only thing that everyone on my floor liked. Because it’s after 3:30 on a Friday and dammit, I didn’t lug my iPod into work for nothing. *The Rules: The Friday Random 10 is exactly that — random. We open up our iTunes, set the thing on shuffle, and listen to 10 songs. We are not permitted to skip any out of embarrassment or fear of redundancy. Commenters are welcome to post their own. **Pax Arcana’s #1 All-Time Least Favorite Beatles song. Defense Department officials claimed last week that a Navy missile scored a direct hit on the fuel tank of a rogue spy satellite, preventing toxic rocket fuel from reaching Earth. Pax Arcana has obtained exclusive close-up footage of the missile striking the satellite. The venerable Whiskycast podcast last week featured whiskey writer Jonny McCormick, who wrote a cover story for the current issue of Malt Advocate magazine on a growing trend among whiskey lovers — buying your own cask. The article itself isn’t online, but the interview with McCormick is pretty interesting. Here’s how it works. You plop down anywhere from $2,000 to $20,000 for an entire cask of fresh whiskey (or whisky, if it’s Scotch). The price depends on the quality of the whiskey and the type of barrel (sherry is more expensive than bourbon barrels). The distillery then ages the cask for you, sending you periodic samples upon request. 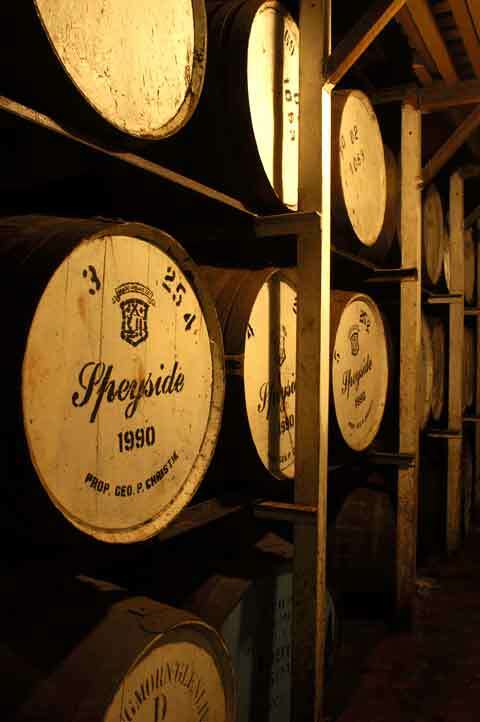 Some whiskies peak at 8 – 10 years, while others can go as long as 25 years or more in the barrel. Once the good stuff is ready, the distillery will usually help you contract out for a special bottling and labeling (they won’t put the stuff in their bottles for legal reasons). In the end, you get about 100 bottles of your favorite whiskey with a customized label. Then you drink yourself silly, lie down sideways on the carpet, and try to eat a hamburger. McCormick himself bought a cask of Bruichladdich for his wedding a few years back, and intends to leave it in the cask until his 25th anniversary. In related news, Father Scott bought a six pack of Budweiser that he plans to age at least until next Tuesday. Pax Arcana back in town with nothing to offer. Too sleepy. JetBlue land too late. 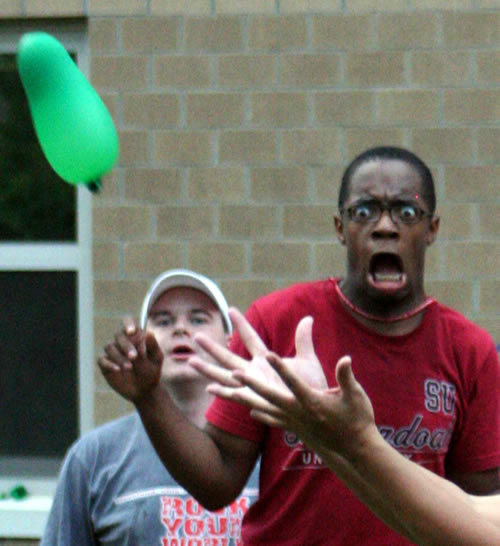 Here funny picture of man scared at water balloon toss. “AV Club: Dana Carvey was famous for having a chummy relationship with George Bush Sr. I’m betting that wasn’t the case with George Bush Jr. Have you gotten a sense of how he felt about your impression? Now there’s a fella we’d love to have a beer with. Pax Arcana is proud to announce the debut of our advice column, “Ask Fidel,” featuring former Cuban leader Fidel Castro. Seems he’s decided to use his newfound free time to offer his wisdom and insight on love, life and lutefisk. We’re delighted to have him! My girlfriend and I have been dating for about three years now and I think I’m ready to pop the big question, but I’m worried I’ve already blown my best opportunity. We recently spent an idyllic afternoon at a state park near our home, walking the beautiful trails, holding hands and talking about life. We stopped at a lush meadow and ate a delicious picnic lunch; the whole time I was telling myself, “This is perfect! Ask her!” but I just didn’t have the guts (or the ring!) Since then we’ve had a few nice dates but nothing that scintillating–it was an afternoon I’ll remember forever. I’m worried that my golden chance passed me by. How can I get the magic back to ask the love of my life to marry me? After an afternoon of so many memories and so many emotions, of so many beautiful things, of so many marvelous words, it is difficult to speak here today. It was essential, however, that we meet, because a day such as today cannot be overlooked.